A team from Westmeath beat off stiff competition in the F1 in Schools regional finals to make it through to the national finals in April. 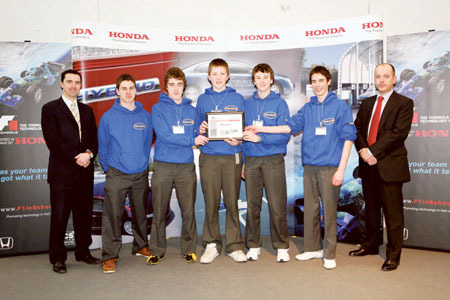 The Colts from Marist College, Athlone, will battle it out against 23 other teams from around the country for the title of F1 in Schools Champions 2009. At the regional finals, another team from Westmeath, Team Dynamo from Columba College, Killucan, won the award for the Fastest D-Type Car. Some 24 teams representing 23 schools from around the country are gearing up for the national finals of F1 in Schools, powered in Ireland by Honda. The finals, which will take place on Tuesday April 28, in Griffith College Dublin, will be the culmination of work started last September in the chase to represent Ireland at the World Championships of F1 in Schools in 2010 and compete against 27 other countries from around the world. Winning teams will also be presented with cash prizes to be put towards computers in their schools and much more! Based on the Formula 1 racing concept, the International F1 in Schools competition challenges second level school students to design, build and race model Formula 1 cars powered by air-compressed canisters. The cars, measuring about 25cm and made of balsa wood, can exceed speeds of 70kph. Teams spend months designing their car on Computer Aided Design (CAD ), and testing it using Virtual Wind Tunnel software. On the day of the competition, cars will race down a 26m long track two at a time, often in under 2.5 seconds. Before every race, an air- compressed canister is inserted into the back of each car. Once this canister is pierced, the cars will shoot off down the track. In addition to racing head-to-head, the competing teams are judged on the quality of their engineering, marketing, graphic design, and resource management portfolios, fund-raising activities, and on a verbal presentation of their work.The F1 in Schools teams are made up of between three and six students with each member having their own allocated responsibility for designing, testing, building, marketing and racing a model CO2-powered F1 car using just a block of balsa wood and some cutting edge technology.